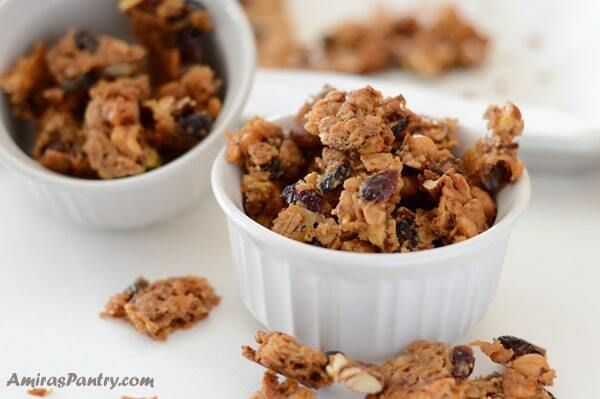 Amazing and highly addicting homemade baklava granola chunks. 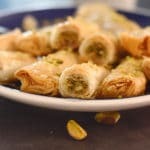 As nutty and as sweet as the traditional baklava, these granola baklava bites are an easier way to get your baklava fix. Heavenly sweet and delicious packed with nuts and honey, this will rock your world, specially in the morning! 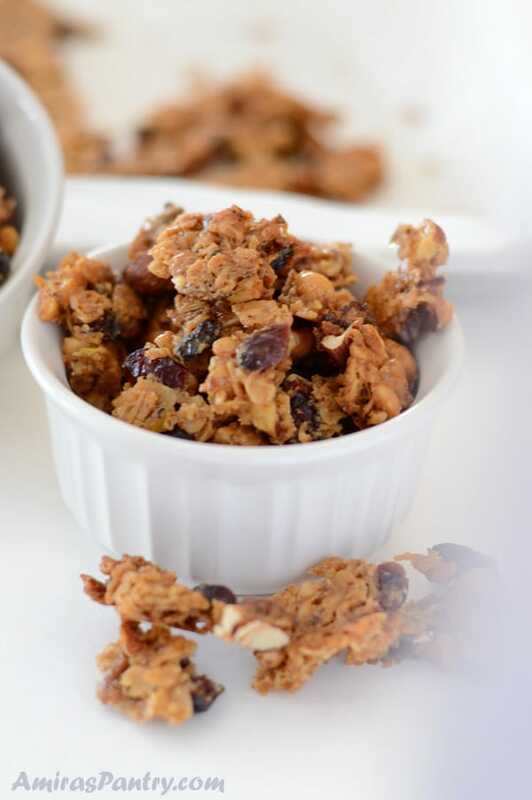 Sweet and sticky little bites, make them chewy or crunchy, it is up to you.This baklava granola would make a great gift in any occasion. I can’t tell you enough to encourage you to make these little gems. My kids and hubby have been snacking on them for a couple of days now, they are really addicting. Today my husband texted me to hide those away from him, because simple he cannot stop  .Kids wanted to help me in this post so they did almost everything. 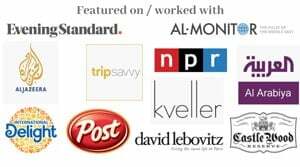 I wrote down the ingredients, they measured, started adding them together and did the video shooting, that’s why the video is shaking , what a great team I have  . I was really proud of them, although I was a little skeptical as they might mess everything up, but I trusted them and they did everything , under my supervision of course, they were thrilled waiting for the result and so was I. When everything was done they waited impatiently for the granola to cool down, it smelled heavenly good in the oven.They all gave it a thumbs up, it is sweet, nutty, chewy and so addicting. 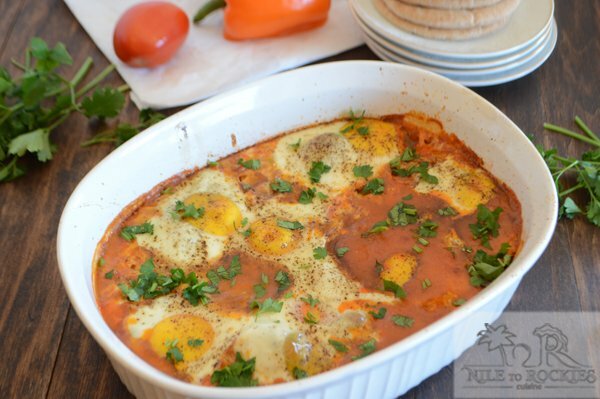 It is not your healthiest choice but at least it is homemade, so that is an advantage by itself. So let’s see with a less shaky photos. 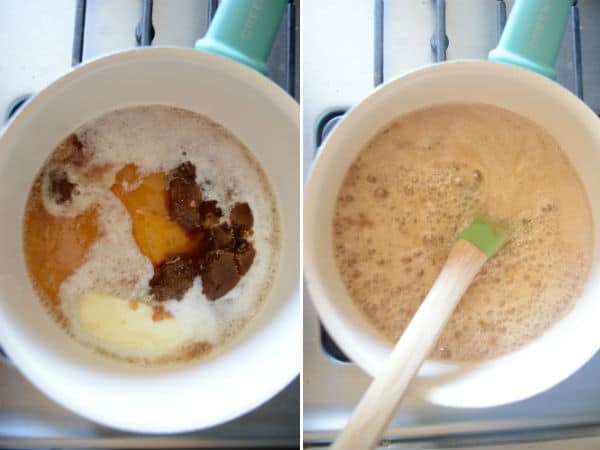 In a small saucepan over medium heat, combine brown butter, sugar, honey, vanilla and water. Bring to a boil then turn off heat. 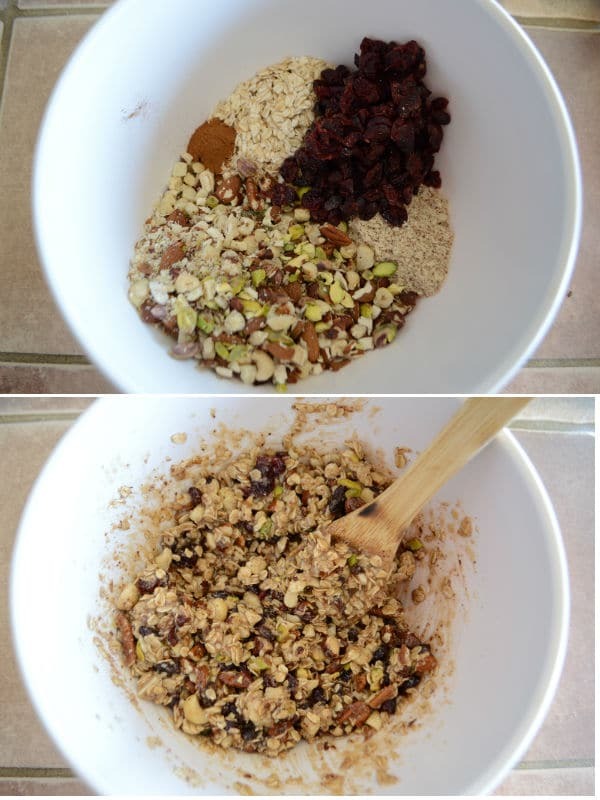 In a deep bowl, mix nuts, oats, cinnamon, almond flour and a pinch of salt. Mix everything well together then carefully add the honey mixture, stir to combine. 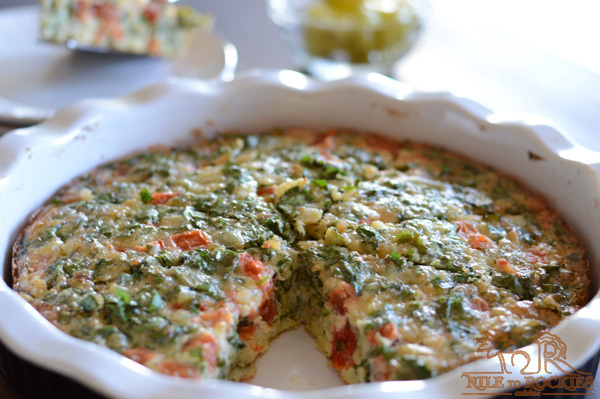 In a rimmed baking sheet, spread the mixture evenly and press with the back of a spoon. Bake in a 350F pre heated oven for 25 minutes or almost 40 minutes for a more crunchy bites. Take it out and let it cool down until you are able to handle. Have fun breaking them into little bites and do not forget to eat the crumbs, it is delicious. They will probably be crispier at the edges and little chewier as you get to the middle. Eat them with yogurt, add cold milk, pack in lunchboxes, snack on them or eat them as a dessert after dinner. In all cases, you’ll find them super delicious and great anytime of the day. 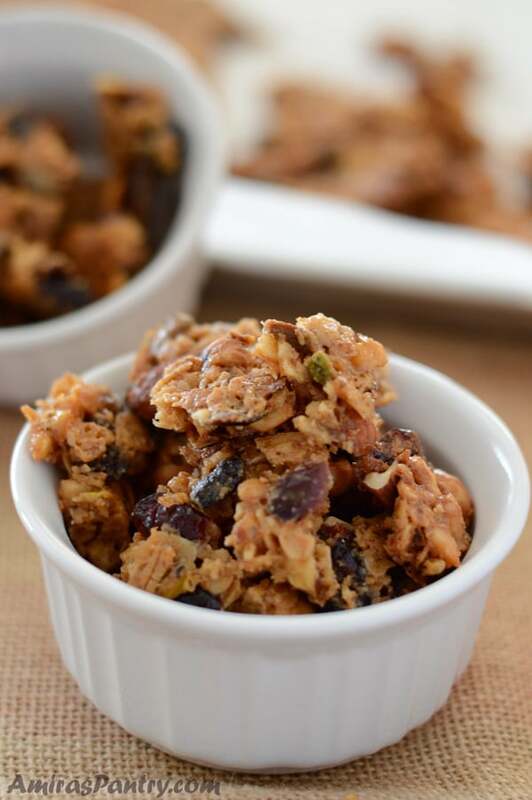 A baklava inspired granola chunks can be made chewy or crispy. 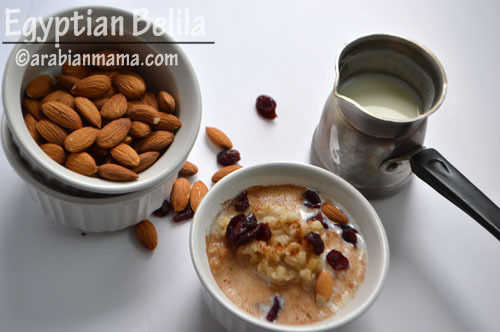 *1/2 cup almonds coarsely chopped. 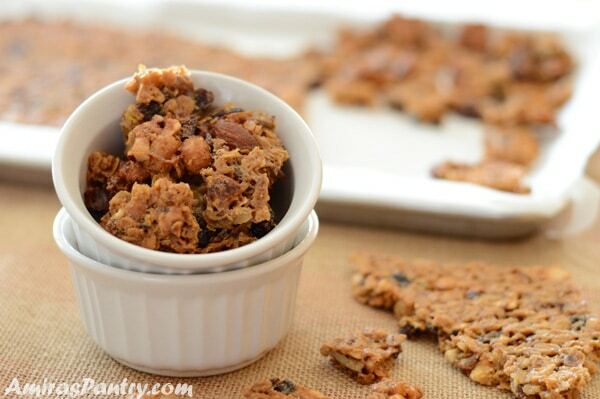 1 cup raisins and or cranberries. In a saucepan, over medium heat, add butter, brown sugar, honey, water and the vanilla. Stir until well combined. Wait until it is bubbly then turn off the heat. 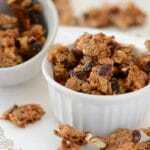 While the mixture is heating up, in a big bowl, combine nuts, oats, almond flour, raisins, cinnamon and salt, mix well. Pour the bubbly mixture over and stir until everything is well combined. 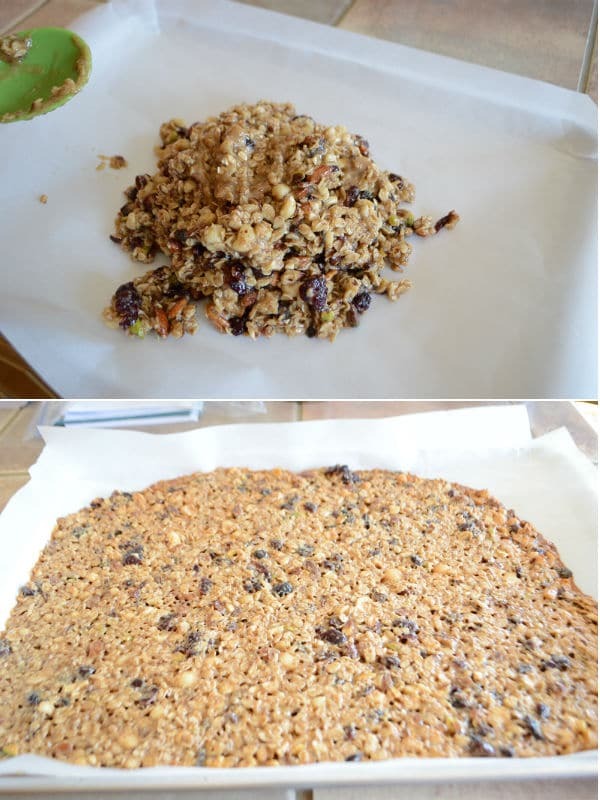 In a large baking sheet lined up with parchment paper, dump the mixture in , spread evenly and press tightly. Pop in a 350F preheated oven until it is golden brown, from 20-25 minutes probably. wait until it cools down completely and break into chunks. If you want the bites to be more crunchy, put it back in the oven for 15 minutes more. * Use approximately 1.5 cup of any chopped nuts you have, but be sure to include the hazelnuts. 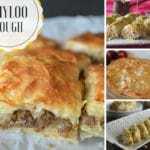 I love your website and have given some of your recipes a try. My question is about the Baklava Granola. 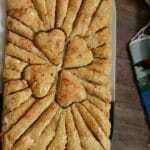 Is all purpose flour fine or is almond flour specifically and why? Cheyl, thanks for noticing the missing ingredient, it is 1/4 cup.